The dog kennel shade cover / sun block top is a woven UV treated with reinforced brass grommets. The shade cover / sun block top provides shade to help keep your pet cooler and reduces the temperature inside the dog kennel by up to 15°. Cable ties are included to secure it to the kennel. You can also use shade covers / sun block tops for sidewalls. This will help protect your pet from harsh winds, snow or sun. Ordering example: If your dog kennel is a 10' x 10' x 6' high, you can order a 6' x 15' to partially cover the sides or you can order two for more coverage. for the dog kennel sun block tops. 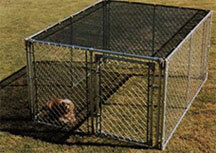 We manufacture custom size of kennel shade covers for Dog Kennels.